There are 18 wildfires now blazing across California, which means many of the state’s residents are waking up to the smell of smoke and hazy skies. 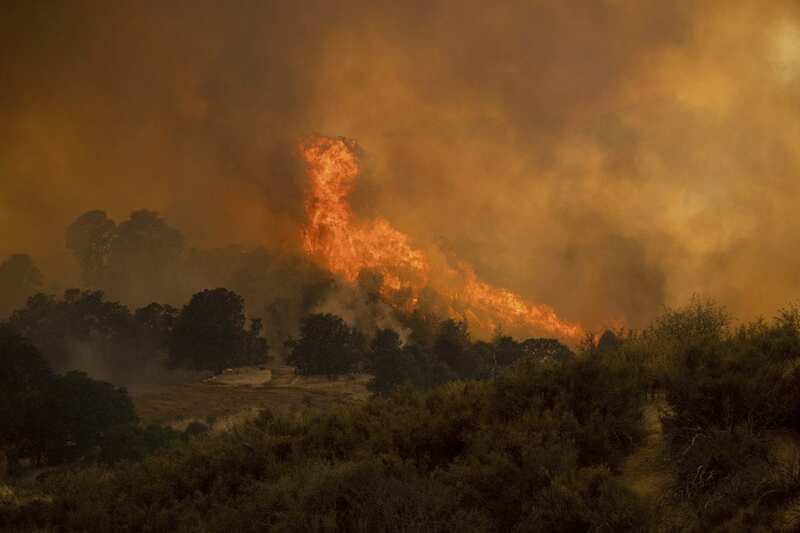 The Carr fire near Redding has scorched at least 145,015 acres and killed seven people, and three fires in Mendocino County are all less than an hour away from Santa Rosa — where some neighborhoods burned to the ground last year. Even so, the view from Danielle Bryant’s bedroom window, in her temporary apartment in Santa Rosa, is pretty unsettling these days. “The orange-tinged sky is just enough to set off my anxiety and feelings of fear,” Bryant says. Last year, on Oct. 8, an explosion jolted Bryant awake in the middle of the night. Howling winds shook her Santa Rosa house. The air was hot. Bryant and her husband jumped in their car and fled with only the clothes on their backs. It was a fight about nothing. She says she blew up after watching the news about all the fires on television. She hasn’t turned on the TV since. She’s hearing similar stories from friends and neighbors. Bryant’s apartment is about a mile from the site of her old house. She’s still working through everything that happened. Many laypeople casually use the term PTSD — post traumatic stress disorder — to loosely describe any delayed response to a terrifying experience. But psychologists and psychiatrists use the term and the diagnosis much more narrowly — it includes symptoms, for example, that must last more than a month and be severe enough to interfere with relationships or work. Rather, the fear, anxiety, sleeplessness or shallow breathing many fire survivors are experiencing right now are healthy and transient, psychologists say — it’s the body’s evolutionary responses to the belief that danger is again near. When a survivor of trauma again senses signs of the previous threat — in this case, the smell of smoke, the orange sky, the “ding” of a cell phone’s emergency alert — the protective survival system kicks in, even when the current danger isn’t close by. “The trouble,” says Jennifer Freeman, a licensed marriage and family therapist in Berkeley, Calif., “is the brain keeps rising to the occasion, even when the threat isn’t current.” Freeman has worked with survivors of trauma and in the aftermath of other natural disasters — including earthquakes and tsunamis — both in the U.S. and internationally. There are a variety of cognitive and physical techniques that can help us through periods of trauma, counselors say, and people vary in which ones they find most helpful. Freeman says one first step to calming the mind and body is to be kind to yourself and respect that your system is trying to help you survive. Gordon recommends reminding yourself out loud that the fearful event is not happening again. It may sound silly to talk to yourself, but the body, she says, recognizes the sound of your voice. Even setting yourself a task — counting all the green objects you can see from where you sitting, for example — can be calming, says another counselor. Some other tricks for ‘coming back to the present’ can be something as simple as tapping your feet, Gordon says. Or smelling something you enjoy — such as tangerine or balsam fir or cinnamon — or playing calming music. To consciously slow rapid breathing, try putting one hand on your belly and one hand on your heart, then breathe out through pursed lips, as if through a long straw. Slowing down your breath activates the parasympathetic nervous system, Freeman points out — and helps calm your internal alarm system. People also can heal via their community — by helping others. Asking questions that elicit the story of how someone survived the traumatic event is an approach Freeman used in Samoa, after the 2009 tsunami. If you’re helping someone else, Freeman says, it’s important to ask them what kinds of help they want — and not assume that each approach works with everyone. When Freeman was working in Samoa, for example, she learned from local therapists and others there that many people preferred to work via community and family groups, rather than in individual therapy. Bryant pulls up to an empty lot overgrown with weeds, and gets out of the car. We carefully tread through some weeds and knee high bushes. “See this outline, this box? That was it. That was our home.” Bryant crouches down and puts her head in her hands. To help process her grief Bryant is taking a writing class. She’s finding it therapeutic to put her painful memories into words and phrases. Even as wildfires rage within an hour of Santa Rosa, Bryant is excited at the prospect of rebuilding her house in the old neighborhood, and moving back –within about year, she hopes. KQED’s Marisol Medina-Cadena also contributed to this story.